email me about this piece. Line forest is an exploration of drawn line patterns. I’ve done a good bit of drawing in black ink, and some with black ink over watercolor effect marker. Incorporating additional colors in fine line pen has always been a bit tricky. Line forest is thus a way for me to test adding a second ink color for contrast. 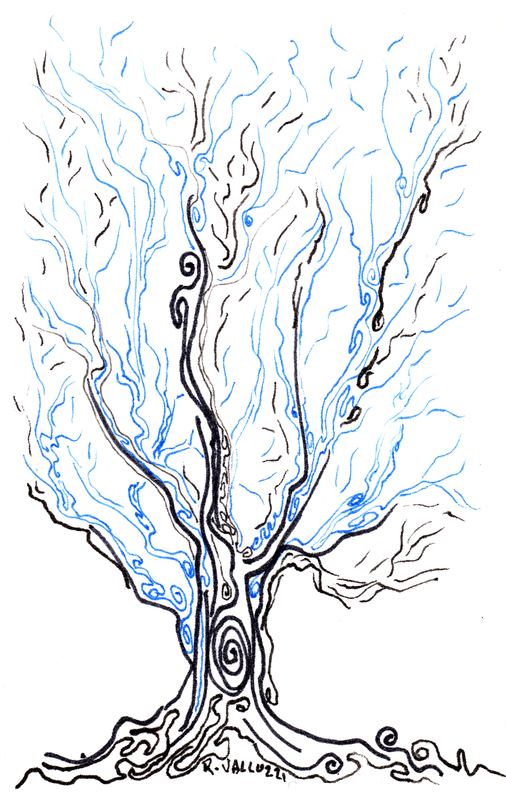 It’s a continuation of the same two color idea explored in “Tree Pattern”, a much smaller and simpler art card. Line Forest is larger than an art card, at 4 x 6 inches. In some parts of the world it would still technically be considered a miniature work, in others it would be just barely too large. It is certainly more complex than “tree pattern”, featuring more deeply nested concentric and parallel lines, more interacting tree figures, and stippling to create a feeling of depth. The style of “Line Forest” is semi-abstract or an “abstracted landscape”. The perspective and the swirling forms of the trees give the piece a somewhat surreal or fantastic feeling, almost fantasy. “Tree Pattern”, an art card is SOLD. “Line Forest” is, 4 h x 6 w inches, permanent archival pigmented ink on acid free paper. I have it in a slim brown wooden frame, but prefer to ship it unframed. The 4×6 inch size is the same as a common photo print size, so there are a range of ready made mats and frames available that will fit the piece. Email me if you’re interested in purchasing “Line Forest”.